“Yeah. Though I don’t think they ever stopped—I think they just drove straight through. And they probably sped a lot,” he added. “Huh,” I said, not exactly sure how to respond to that. It hit me that, while I didn’t want to do this, Roger probably wanted to do it even less. Why would a college almost-sophomore want to spend four days transporting a high schooler across the country? Maybe this was Roger’s way of saying that he wanted to get it over with as fast as possible. “Have you ever taken a road trip?” he asked. I turned to squint at him and shook my head, feeling very lame. I knew that he didn’t mean a family excursion to see a historical landmark. He meant a road trip, the kind that cool people took in college. “Have you?” I asked, even though I had a feeling the answer was yes. I took a sip of my shake, hoping my relief wasn’t obvious. So it wasn’t me he had a problem with, just my mother’s version of the trip. Which was entirely understandable, given the places that she’d chosen for us to stop. I shrugged, even though my heart was pounding. It was a legitimate question. Knowing my mother, she’d probably be call­ing every hotel to make sure we’d checked in. But there was a tiny, reckless piece of me that wanted to be the difficult one for once. That wanted to make her worry about me for a change. That wanted to show her what it felt like to be left behind. “I don’t care,” I said. This wasn’t exactly true, but I liked the way it felt to say it. It was something Charlie would have done. And something Amy! would never do in a million years. And as I thought about the four hundred dollars in my front pocket, it occurred to me that we might be able to use it to buy just a little bit of freedom. “We’ll still get there by the tenth, right?” I asked quickly. My mother was not going to be happy we were ignoring her route, but I knew she would have a conniption if we took longer than the allotted time. “This is just a detour,” I clarified. “Just a detour,” Roger agreed, nodding. He smiled at me, and I felt the impulse to smile back. I didn’t, but the feeling was there, for the first time in months. The In-N-Out employee to our left suddenly raised her vol­ume and began screaming at her soon-to-be-ex. Apparently, his name was Kyle, and he knew exactly what he’d done. Feeling like I was overhearing something I probably shouldn’t, I jumped to my feet and began to walk around to the front of the car when I saw that Roger hadn’t moved. He was still listening to the breakup with a slightly nauseated expression on his face. 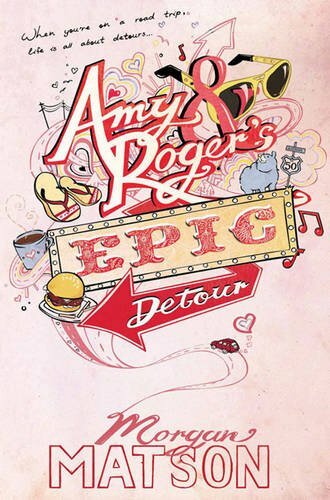 You can read my review for Amy & Roger's Epic Detour here. You can check out the next stop on the tour over at Wondrous Reads tommorrow. I am so looking forward to getting a copy of this!